The Bolognese dog breed received its name from the town of Bologna, Italy, where it was first developed. A toy breed developed from the Bichon and Maltese lines, the Bolognese soared in popularity among royal families and was often given as gifts between kings and queens. However, the breed’s numbers nearly dwindled to extinction near the turn of the century. Thankfully, the Bolognese breed was recently revitalized by Italian and other European breeders. Despite their recent growth in popularity, the population of Bolognese dogs contains only a few thousand registered members throughout the world. In the United States, their population stands at approximately 1,500 dogs. For reference, there are approximately 400,000 registered golden retrievers in the United States. Despite their rarity, the Bolognese dog breed is an incredible companion and makes an entertaining, loving friend. Due to their small population, finding a Bolognese may be complicated or time-consuming, so be sure to contact a reputable breeder or adopt an adult Bolognese from a shelter. The Bolognese dog weighs six to eight pounds and stands ten to twelve inches tall. Like other dog breeds developed from the Bichon breed, the Bolognese is small, with a long, fluffy white coat. Their ears can sometimes be tipped with beige, although that sometimes grows out as they age. They also carry their tail curled along their back. The Bolognese coat is a single coat, which means it sheds far less than double-coated dogs. This characteristic places the Bolognese in the hypoallergenic category and makes it more attractive for prospective owners who may be sensitive to dog dander and fur. Additionally, due to their low shedding nature, they rarely leave fur throughout the house or on furniture like other dogs. However, allergy sufferers should take into consideration that no coated dog is truly hypoallergenic, and, since the Bolognese does not shed on its own, it requires daily brushing and monthly grooming. The Bolognese dog is a generally healthy breed, with a lifespan of approximately 12 to 15 years. These dogs do best when exercised with both play and daily walks. As the Bolognese is also prone to weight gain, their diet and exercise should be carefully monitored. Since the Bolognese is a toy breed, they may be susceptible to common toy breed problems including luxating patellas as well as collapsing tracheas. Therefore, traditional and choke collars should never be used as they may collapse the dog’s windpipe. Instead, choose a harness for your Bolognese. Additionally, during monthly grooming, your dog’s ears, eyes, nails, and teeth should be cleaned as well as its coat. The Bolognese embodies both stubbornness and charm. These dogs are both incredibly intelligent but also playful, as they exhibit puppy-like natures for the first ten years of their life. Training, however, might be a little difficult with your Bolognese due to their natural stubbornness, but once successfully trained, you and your dog will develop a strong bond of trust and communication. Due to their intelligence, they will become bored if a training routine is too simple or unvaried, so try many different types of obedience and agility training with your Bolognese, especially in varied environments. Additionally, modern and humane training methods should always be used with your dog rather than force or shouting, since canine behavioral scientists have shown that modern methods are more effective. Due to its small size and relatively low exercise need, the Bolognese is a perfect fit for apartment life, but it would also thrive in a home with a yard or large area to play, as long as they are supervised when they are outside and sleep inside with their family. From the moment you bring your Bolognese home, you will have a loving, carefree new member of your family. This dog breed forms strong bonds with its owner and their loved ones, and the Bolognese is happiest around those they trust, although they are sweet and excited to meet new people and animals. 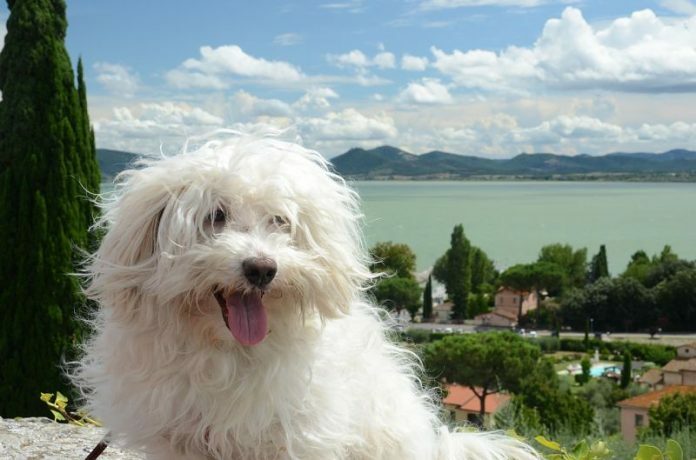 The Bolognese is a perfect family dog, since they adore children and love having playmates, as long as the child understands the fragility of such a small dog. In the suburbs or in the city, this rare breed will make every day joyful.